Are becoming increasingly more and more popular. They appeal to those who want the same benefits of sauna bathing but with out the higher heating temperatures. Vast amounts of marketing material surrounds the benefits of infrared saunas and it is increasingly difficult for prospective customers to decide what type of sauna they would prefer. At last the solution! Our Hybrid Sauna Technology TM is quickly setting the standard for Infrared Saunas. Our 4 Hybrid sauna heaters with provide the flexibility of both traditional Finnish heaters with modern Infrared heater giving the bather the best of both systems. It uses large carbon fiber infrared heaters 30” x 22” that produce a type of light energy wave (FAR Infrared) that directly penetrates deep into the skin of the bathers stimulating muscle tissue and activating sweat glands. Essentially this is the same kind of radiated heat we get from the sun or a hot light bulb. This radiation is invisible to the naked eye. It is also entirely harmless - as a matter of fact, this is the same heat used to warm new-born babies. When infrared rays hit your skin, they transfer heat energy to it. Your skin temperature goes up and you react by starting to sweat. Because the Infrared sauna only heats objects the air can be at a much cooler level than traditional convection saunas. The infrared heat penetrates deep into the body causing bathers to sweat at a lower temperature than a traditional sauna. 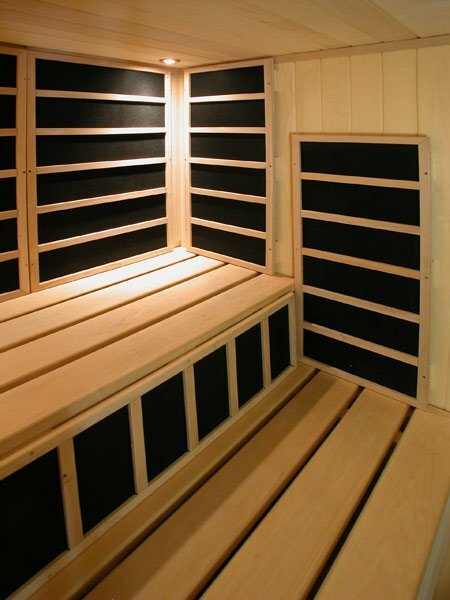 What previous infrared sauna rooms lacked is the ability to control the ambient air temperature accurately. Because Infrared penetrates objects not air, it can take up to 20 minutes just to warm a small infrared room up to 130 degrees. Bathers that want it hotter were out of luck. Until now! 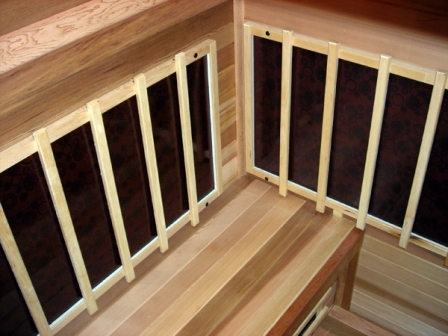 The other draw back of infrared saunas is they simply can't handle any amount of moisture, the thin wood design of most IR cabin saunas would quickly warp the wood and the ceramic or incolly heaters are simply not designed for moisture. However, with the patented Magicyura carbon fiber infrared heaters, bathers can now safely take advantages of both heat sources. Small amounts of water can be added to the Finnish sauna to control the interior moisture level. Light amounts of water on the skins surface quickly opens the pores resulting is a deeper cleansing not possible with only Infrared heat. And those with dry skin or congestion will surely find the added benefits when adding moisture to the sauna. The dual heat sources allows bathers to quickly bring the ambient air temperature up to their comfort level. Once this level is reached they continue to be immersed in the healing benefits provided by the FAR infrared spectrum. A small splash of water on the skins surface or on the sauna rocks quickly opens the pores and the sweat begins. Never has a sauna room been so versatile and so effective!